"Mom, are you blogging or are you bragging? ", my son teased when I had him take a photo of my sweater for my last blog entry. This was just his 13-year-old sense of humor talking, but the comment stuck in my mind. It reminded me that if I am sharing a successfully finished project, perhaps I should 'fess up about the mishaps made along the way. 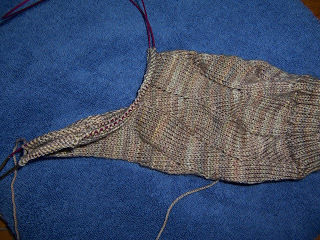 1) As I finished the collar on my lace pullover, I wanted to try it on before binding off. I was perfectly aware that the lace stitches were being held on a 16" circular needle, which is a good 4" less than the circumference of my head. Did that stop me? Nope! I did it anyway, because I was too impatient to transfer the stitches first. So, I lost some stitches and had to spend three times as long reknitting the rows instead of the few minutes it would have taken to put them on a longer needle. I was distracted and I accidently skipped the entire set of instructions for turning the heel before picking up stitches for the gusset and foot. I'll fix it today, but last night I took it as a sign that it was time for bed. today I'm back to feeling like I'll be happy if I can just catch up on laundry and remember to floss! How about you? Are you sticking to any New Year's resolutions? We love the blog, Shannon. Yep, I think we should all show our bonehead moves from time to time. Keeps it real. I tend to mess up a lot, and if it's late, it's always a good stopping place.